This weekend I took part in a geography excursion to Halle an der Saale and Magdeburg in Germany from Friday night the 2nd until Sunday morning the 4th of February, Russ's birthday. A colleague of mine had arranged the adventure and had invited me to accompany him and a group of 14-year-old students we both teach. That in itself was cool, but in addition, it was also a wonderful opportunity to boldly place quotations from Russell Hoban's works in a location the yellow paper had never been to before. Having very little time to select quotations for SA4QE I restricted myself to two, one from Riddley Walker, the other from The Medusa Frequency. Our first destination on Saturday morning was the fabulous "Landesmuseum für Vorgeschichte" in Halle an der Saale (http://www.lda-lsa.de/landesmuseum_fuer_vorgeschichte/). I thought a passage from Riddley Walker would certainly be suitable for a museum specializing in prehistory. Little did I know just how perfectly the opening lines of the novel would resonate with the things we learned at the exhibition, whose theme was climate change and its impact on evolution (Klimagewalten: Treibende Kraft der Evolution). At the end of the tour, while the students were busy making necklace pendants out of shark's teeth or pieces of reindeer antlers, my colleague and I were invited for coffee by Monika Bode, the museum pedagogue. It was a real pleasure to talk to her and before going back to join our students, I explained to her what SA4QE was about and asked if I might leave my quotation somewhere in the museum. She immediately offered to put my yellow A4 sheet in the guest book on Sunday, so that it would be properly "4qated" on Russ's birthday instead of one day early. Then it was time to move on. We travelled from Halle to Magdeburg, learned about the city's history, visited churches, the town hall, and various monuments, we sampled Dark Magado and finally got to Friedensreich Hundertwasser's "Grüne Zitadelle", a fantastic building without any straight lines (http://www.gruene-zitadelle.de/en). After dinner, the students enjoyed a live escape game at Mission Exit (www.mission-exit.de), then we had to go back to the train station to begin our homeward journey with changes at Stendal and Hannover. As there were delays due to technical problems, we didn't know if we would be in time to catch the night train from Hannover to Zürich. Fortunately, the ticket inspector managed to make the train wait for us, but we had to hurry up as they allowed us no more than five minutes to get from track 11 to track 4 at the main station at Hannover. Let me just say, we did it and so got home safe and sound arriving in Zürich at 9 o'clock this morning. An ordinary mirror is silvered at the back but the window of a night train has darkness behind the glass. My face and the faces of the other travellers were now mirrored on this darkness in a succession of stillnesses. Consider this, said the darkness: any motion at any speed is a succession of stillnesses; any section through an action will show just such a plane of stillness as this dark window in which your seeking face is mirrored. And in each plane of stillness is the moment of clarity that makes you responsible for what you do. Consider this, said the train wheels, repeating the message tirelessly moment after moment on the miles of cold iron that lay shining in the dark that led to Harwich and repeating face on face the faces reflected in the windows. 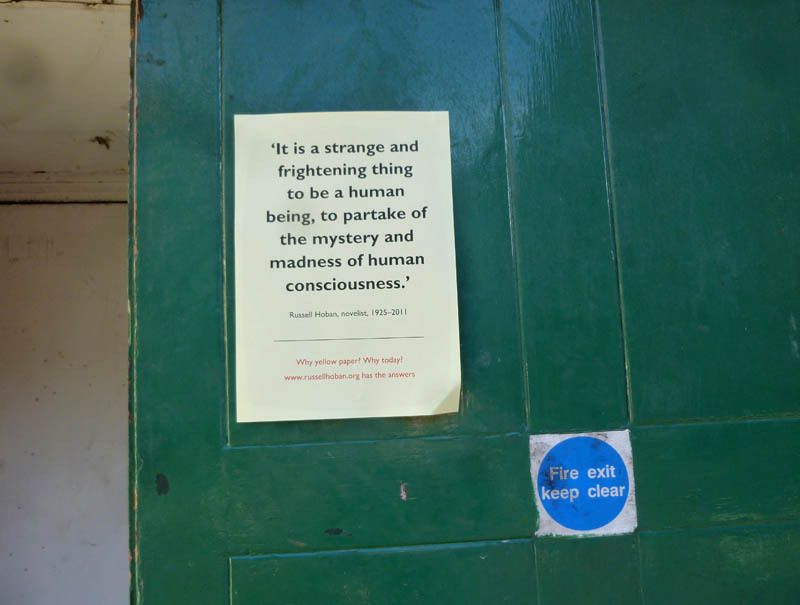 As we travelled by night train twice, my second quotation had to be from The Medusa Frequency, of course, the passage in chapter 13 where the darkness and the train wheels talk to Herman Orff on the night train to Harwich. I had already taken a few photos on the outbound journey to see what the camera could do in the dark and whether it was possible to play with different kinds of reflections. But the quotation had to wait for the homeward journey and Russ's birthday. It took me some time to find a good spot for my yellow A4 sheet. At first I laid it on the pillow of my bed - not really interesting at all. Next I tried placing it on the window sill of the window in my compartment and simply waited for something to happen behind the window. I took a photo when another train arrived at the train station of Freiburg im Breisgau, where we had stopped. The lighted windows of the other train invited the eyes in, but there were no faces in the windows. It was an empty restaurant car, slightly creepy - perhaps a man-eating killer carriage? -, and it would have made perfect sense in a quotation event to honour Stephen King but not Russ. So I tried again later, and the third is the picture I like the best although it wasn't dark anymore. It was taken at dawn, when another train was passing ours. My reflection is visible twice, in the window right in front of me and also in the window of the other train. Interestingly, the closer reflection is more blurred whereas the reflection in the window of the train passing ours shows a lot more detail. Even the piece of yellow A4 paper can be recognized and the bottle of water I had just emptied. Whereas Herman had to learn about responsibility, my lesson from the plane of stillness probably is that distance makes reflections clearer. But I'll have to keep thinking about this idea for a little longer, and seriously, I need to go to bed and rest now. Happy Russmas Day 2018 to everyone!